We are enjoying this little oasis in the desert. Dateland is 65 miles east of Yuma and miles from anything else. But it has the 'it' factor for us. 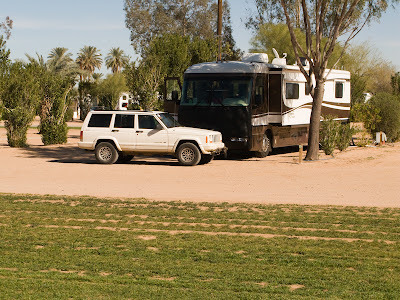 We're staying at the small Dateland Palms Village RV park. Situated between the expressway and the railroad tracks, It's far enough to not be noisy but close enough to watch the world go by in a constant stream of cars, trucks and RV's. We are only a couple hundred yards from the railroad tracks. 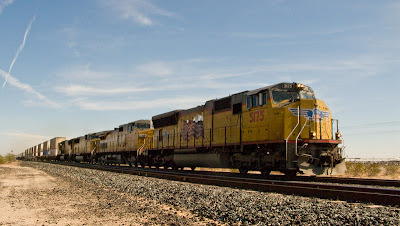 That's ok with us; we enjoy watching trains go by, usually about every 30 minutes. What you won't find here is hundreds of other RV's squeased in around us, constant commotion, and numerous activities going on around us. There are only a few other Rv's here -mostly extended stays. In the late afternoon, usually 2-3 rv's arrive, pull into sites and then leave the next morning.The weather has been nearly perfect since we arrived, sunny and warm. A wonderful tonic for the soul . We've enjoyed a daily walk, being outside, and having our windows open. Even Mollie loves the sun and has enjoyed being outside when she's not helping with Judy's knitting. There's even a large strip of grass across from the RV so she is especially happy about that! Across the street is a date farm. 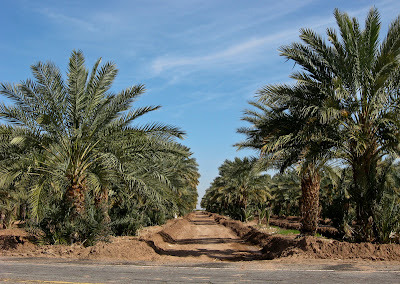 Tall, beautiful date palms are lined up in rows. Date shakes are very popular in this area and "world famous date shakes" are served in the small restaurant that's across from the RV park. They are very good... we had to try one!! Dateland also has a memorable past. We found what appeared to be an old military base and air field. Upon further investigation we found these plaques that explain a little of Dateland's past. 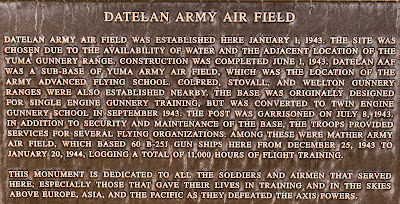 The Datelan Airfield encompassed over 3200 acres and was built in only 6 months. It started out as a gunnery training base and eventually converted to B-25 bomber training, logging a total of 11,000 hours of flight training during World War II. The airfield later was also used as an Italian interment camp. The base was reduced to caretaker status in 1945 with one officer and 12 enlisted left to maintain the base. 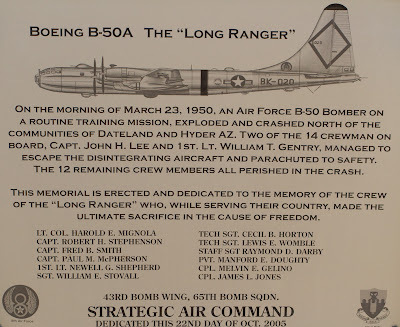 In 1957 the main hanger and other flight line buildings mysteriously burned down. During the investigation, it was discovered that B-25 parts were missing. The officer in charge was court martialed, and the base was permanently closed in 1957. Dateland was also the site for two of General Patton's desert training camps. The area south of Dateland is still being used to train troops for desert warfare before going to Iraq. Wow, the skies are beautiful there! 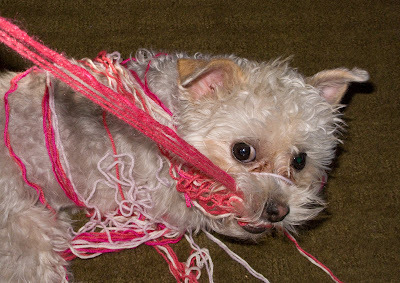 And it looks like Mollie is up to her usually antics. Don't worry, I won't let Emma see that picture!